Hello Kitty also knows no recession. Luxurious Hello Kitty products have become more of a fashion statement. This time, a jewelry-covered Hello Kitty doll from the pop-culture crazy company Sanrio is on display at a watch-jewelry trade fair in Basel, Switzerland. The 15 million yen (approx. 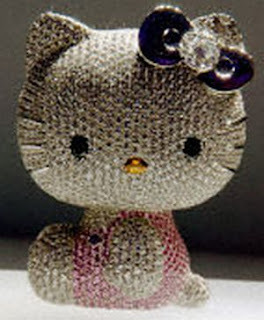 $152,585) “Super Hello Kitty” has been created in collaboration with Austria’s crystal glass maker Swarovski. This dazzling enKusty Kitty is being showcased to commemorate the 35th anniversary of the celebrated character. For the price of this blinged Hello Kitty doll, you could buy a Hello Kitty guitar, Hello Kitty iPod mini, Hello Kitty gold business card and much more. Pimping the vehicles with gold, diamond and other precious stones does help to flaunt your riches on the road. We have seen so many bling-bling vehicles earlier, including the Swarovski-studded bikes, gold plated Porsches and the diamond-studded Mercedes coupe. The latest to catch our attention is a gold plated Samand LX sedan from Iran. The $1 million car has raised eyebrows in the city of Tehran, when its owners had to drive it through the streets after an accident. The car was to be delivered to some Russian buyer, but the whole thing went wrong when the truck carrying this golden beauty collided with a pickup. 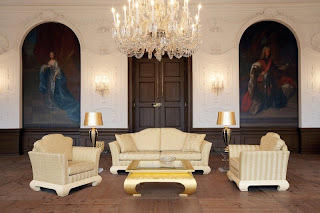 The gold-plated sedan is the creation of two goldsmiths from Isfahan, who got the inspiration after seeing images of a gold-plated Porsche on TV and on the Internet. 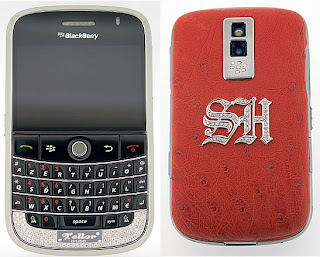 For those BlackBerry owners who are contemplating sticking with this minimalist business phone might consider this blinged “Tellor” version, which is paved with a total of 205 diamonds. Besides, the phone is available in a variety of custom designs: Celtic cross, initials, you can choose to customize it as you wish. And, you can choose from the choices of skins: ostrich, stingray, lizard, and alligator. Both QWERTY or AZERTY keyboards are available. This diamond-studded BlackBerry Tellor will be available in a limited edition of 50 units, and the price tag is still under wraps. Living inside a shipping container! How do you like the idea of living inside a shipping container? Kinda weird? But that’s not the case with the Adam Kalkin’s prehab homes made from shipping containers. The architect makes container homes that are good looking, transportable and recyclable. He isn’t the only architect to make shipping container homes, but what he creates is exceptional and luxurious. The best examples that explain his creativity are the Bunny Lane, his own home built with a 19th century clapboard cottage inside an industrial hanger, and the push button house, which takes just 90 seconds to expand to reveal a five-room home. Anyway, Kalkin charges $150-$400 per square foot for his container homes and the cheapest of his creations sells for $50,000. Some of his prehab homes are a single room in a single container, while the others feature a range of structures built inside them with that luxurious touch. Does the idea of living inside a shipping container still looks weird to you? 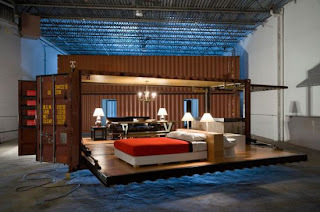 READ MORE - Living inside a shipping container!